First! Thank you for coming to visit BlackWomenInBroadcast. This site was designed to Celebrate and Explore the images of African American women in broadcast television and in the media and was truly a labor of love. I hope you enjoy and become informed. What is the inspiration behind BWIB? – Growing up in St.Louis, MO when my family watched the local newscast I was fortunate enough to see Black women who looked like me in the profession I desired to go into. As I grew older those numbers increased and I found myself wondering just how these women advanced to their current positions. Where did they study Journalism? What small markets did they start off in? Did they always know they wanted to go into Broadcast? However, the salient question was… what did it take for them to get there. 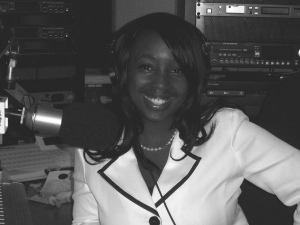 That desire to understand Black Women in Broadcast (BWIB) stories intensified, as I began my career as a journalist and noticed few others like me in the newsroom. The experiences that I went through both positive and challenging motivated me to create a forum that recognizes the tremendous trials that BWIB face, while also giving BWIB a space to freely share their stories and triumphs in their careers. This site is designed to serve as a tool of encouragement to women who are currently in broadcast and to those who are considering pursuing the industry. This particular idea for this website developed through a Graduate Course at the University of Georgia under the direction of journalist/writer and UGA Professor, Valerie Boyd. While to many I would still be considered “fresh” in the industry it did not take long for me to recognize a need to highlight these women in broadcast not only so that they can have a forum, but also to showcase Black Women in Broadcast. Serving as an educational tool for all. Enjoy! Brittany you are an Inspiration to black women that will come behind you and women that have paved the path before you. Your mom and dad have often told us ‘at ASCC’ about your journey, your commitment and your accomplishments. But I want you to know that we could not be more proud of you and the mantel you have decided to uphold. Keep living your dream sweetie and be blessed! You go girl! So proud to say I know you. Love You much!